Laughing Buddha Design has been designing and developing websites since 2006 and is a trusted partner for web design in Byron Bay. We aim to provide the best possible solutions for your particular needs, working to get the best out of your budget all the time. We have worked with many website applications, on countless projects, and understand the importance of making your website go to work for you. Our extensive experience with e-commerce, email marketing, content management systems, and search engine optimisation (SEO), as well as providing top level hosting and domain name registration will give you the confidence that your project is in good hands. Laughing Buddha Design is based in Lennox Head just south of Byron Bay in Northern NSW, Australia. It’s a beautiful part of the world and we love the green-ness (is that a word? ), the open spaces, beaches, and the diverse community and lifestyles. 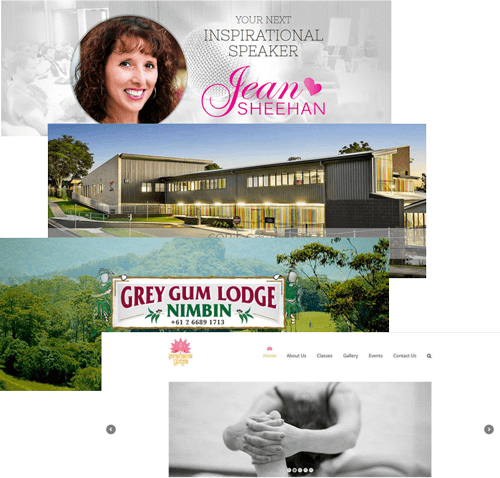 We have designed websites for clients all over the region including Lismore, Ballina, Lennox Head, Byron Bay, as well as clients as far flung as Sydney, Melbourne, the Gold Coast, and Brisbane. We really like to hear from our website visitors so say hello and tell us what business needs. Central to any website project is the design. Websites that look great make a good impression. Your web design is your advertisement to the world, and for many customers it’s the first thing they see, so first impressions count. The websites we build for our clients look great and are easy to use – for you and your visitors. We know the importance of design for your website, and we know that budgets vary considerably. We cater to our client’s varied needs by providing a range of design solutions at different price ranges. Designing effective websites requires experience to balance aesthetics with the technical requirements of cross-browser compatibility, page load times, easy site management, and the ability to grow with your business. Are you ready to sell online? Or are you selling online and want better results … Selling online can increase your marketsize many times over, and help to buffer against fluctuating local market conditions. To get the best from your online store you need to have solid E-commerce infrastructure – robust, secure, and easy to use. You need a system that keeps up with the rapidly evolving trends on the web and gives you full control over your store and products. WooCommerce powers more of the world’s ecommerce websites than any other platform. It’s flexible, secure, easy to use and looks great. It’s full of features and integrates seamlessly with the WordPress Content Management System. We have extensive experience WooCommerce, offering you the highest levels of security, stability, and customisability. When it comes to selling online, you must have security, you must have the ability to manage your store, and you must be able to promote your products online through multiple media and networking channels. After all, if you don’t leverage the power of the web you’re not reaching your full sales potential. We provide complete E-commerce solutions, including design, setup, analytics integration, store migration, and real time transaction processing with PayPal or other payment gateways. Email Marketing is the most cost-effective way to communicate with customers and promote your business. Communicate with clients in so many ways – newsletters, special offers, product maintenance tips, member notices, industry news, or whatever information your customers appreciate. We use some of the best Email Marketing software available giving you complete control over your email campaigns. Build trust with your subscribers and boost your bottom line by marketing the smart way. Search Engine Optimisation is the process of optimising your website to get a better response from search engines. Search engines use complex algorithms to analyse the billions of web pages on th e internet. If your site is not optimised you probably aren’t getting as much traffic as you should. We have Search Engine Optimisation professionals to help you get the best out of your website investment. We provide the highest level Australian hosting with generous CPU and memory allocation (that means it’s fast), free SSL certificates, hourly backups available, hardware firewall, unlimited email accounts, and more. The infrastructure is highly reliable and our flexible plans make it easy to upgrade as your business grows. We register domains at competitive prices with options such as ID protection and domain forwarding. Get your domains registered through a reputable reseller and the peace of mind of knowing they are all registered in the one place and easily manageable. Laughing Buddha Design is proud to have served many clients with ecommerce and web design Byron Bay, Ballina, Lismore, the Gold Coast, and as far as Brisbane, Sydney, and Melbourne. We pride ourselves on attention to detail and doing a comprehensive job, not cutting corners or doing the bare minimum that we can get away with. We understand the importance of security and using high quality infrastructure. Our many years of experience working with WordPress and WooCommerce gives us an edge in plugin and theme selection, and getting the best from your online presence. These are some of our recent websites that we’re most proud of. Click on the images below to view each website. ‘As an entrepreneur and International Speaker I wanted a website that represented me so I could share it with my clientele. Dom of Laughing Buddha Design was not only professional but also so accurate in making what I wanted. His fabulous service in planning, creating and executing the website has been first-rate. And of course the after care service continues which allows me to do my career. I highly recommend him and have done so with my clients. Thank you Dom. Laughing Buddha Design has been invaluable for our business – designing two websites for us over the years, and exceeding our expectations on each occasion. We cannot praise their service highly enough. We knew very little about the importance of redesigning our business website until we were introduced to Laughing Buddha. Dom developed a professional and modern looking site that we are extremely proud of. We can now easily log in to add and modify products for our webstore all on our own. Thanks to Laughing Buddha our old clunky site is a headache from the past. Laughing Buddha Design has curated and managed my website for a number of years. They have kept the site open and functioning smoothly at this time and are highly responsive for issues. Recommended! We’d love you to contact us either to say hello, ask a question, enquire about a website, or give us some feedback about ours! Email us through the form below or call us on 0432 84 22 00. Byron Bay Web Design and Development, Ecommerce Website Design, Responsive Web Design, Content Management Websites, Mobile Friendly Websites, Ecommerce Websites, Search Engine Optimisation (SEO), Website SEO, Email Marketing, Website Hosting, Domain Name Registration for the Northern Rivers, Far North Coast NSW and Australia wide. We provide a complete website service to Byron Bay, Ballina, Lismore, Clunes, Alstonville, Gold Coast, Bangalow, Yamba, Tweed Heads, Brunswick Heads, Lennox Head, Mullumbimby, Murwillumbah, Pottsville, Suffolk Park, Wollongbar, Kingscliff. We even have clients as far afield as Brisbane, Sydney, and Melbourne and can develop and service websites Australia wide.